B&H is the exclusive advertiser for this site. If you don't have an adblocker in place, you'll see their ads in the right-hand column on every page, and at the bottom of pages for which products are mentioned in which they still sell those items. 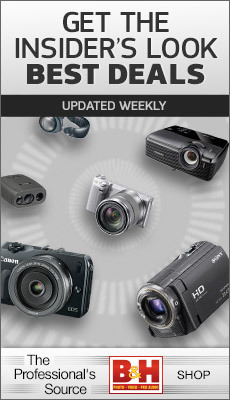 B&H and I have worked to try to make the ads that are served relevant to the information in this site. I see the advertising as much as a service to the reader to help them quickly find items of interest to them. Use any of the B&H ads or links on this site and you’ll be helping this site. This Amazon program costs you nothing but helps provide this site revenue. It's called an Affiliate Program, and the above links are an example of that. Here's how it works: when you click on an affiliate link on this site you're taken to the Amazon site with an ID that identifies that you came from this site. If you purchase something during that session, bythom gets a small commission. However, note that the price you pay for something from Amazon is always the same whether or not you started on my site or not. Thus you're essentially diverting a small portion of what you pay from Amazon to me, not paying more to Amazon to support me. All affiliate links are clearly labeled as such on this site to conform to FTC regulations.